Tasting Hawai'i With Moloka'i Chef James Temple: Bargain Time! I just love finding bargains, especially food bargains. Yesterday Kumu Farms, our local fresh produce connection, had fresh cauliflower from their Maui farm for $2.50 a pound, which is about $3.50 for each head. At Friendly Market today, they are selling for $6 a head. I bought 2 heads from Kumu Farms thinking that I would pickle one of them with some hot red chili peppers, also purchased from Kumu Farms. Ati, who runs the produce store, said "everybody is buying the cauliflower today". I didn't want to tell her what a bargain it was. 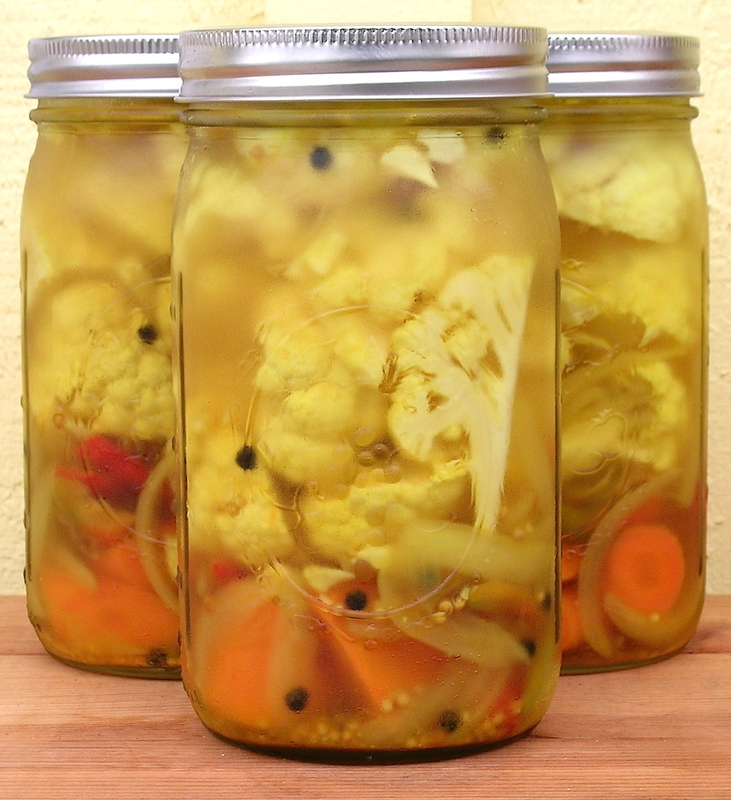 So you may wonder what to do with this beautiful mixture of colorful pickled vegetables? Well you could be selfish and eat them all yourself over the kitchen sink, or you could give one of the jars away as a gift, but don't be afraid to remind the lucky recipient to "return the jar" if they want more next time. Personally I like to serve these as condiments alongside a fish taco, or with fried chicken or pork ribs. Whatever you decide, but save the spicy liquid to pour it over salt brined sliced cucumbers as a salad dressing, whatever... they won't last long. First make sure the canning jars and lids are sterilized by boiling them for 10 minutes in a large pot, then make a brine by combining vinegar, water, sugar, salt, and turmeric powder in a small pot and bring to a simmer. Meanwhile in a large fry pan, sauté the onions and chili peppers in 2 teaspoons of olive oil, over medium heat, stirring until the onion is slightly caramelized but not burnt, about 5 minutes, then add the garlic, mustard seeds, and black peppercorns and cook for another minute. Pack sterilized jars with the raw cut cauliflower, carrots and the onion/pepper mixture, alternating so everything is mixed. Be sure and scrape all of the mustard seeds and whole peppercorns into each jar. Using a ladle, fill jars with the hot brine mixture, leaving 1/4 inch of headspace and remove any air bubbles in the jars. Clean jar rims, and secure two-piece lids. Process the filled jars for 10 minutes in a large pot of boiling water (I use the same boiling water that I sterilized the jars with. Carefully remove the jars from the hot water with a "jar lifter" (see link above), and let cool on the counter. After they have cooled, store them in your refrigerator for 2 days before eating (I know, it's hard to wait that long, but it's necessary). This will give the cauliflower and carrots a chance to meld with the spices, making them delicious! Makes 3 quarts. Note: For other pickled vegetable recipes (click here) or check "condiments" under the "Recipe Index" tab above. Place the cut cauliflower onto a serving platter. In the bowl of a food processor, or in a blender, place the cream cheese, cilantro, lime juice, avocado and chile, and blend until smooth and creamy, about 1 minute. Season with salt and pepper. Transfer to a small bowl and serve with the cauliflower for dipping. Makes 4 appetizer servings. Preheat oven to 450˚F. Combine the pork with the marinade ingredients in a small bowl and set aside. On a parchment-lined baking sheet, spread out the cauliflower in a single layer and drizzle with olive oil. Add the scallion, sesame oil, wine, and the soy sauces. Season with additional salt if needed.Cover the lid and bring everything to a simmer. Uncover, give everything another stir, and serve over rice! Makes 4 servings. Adjust an oven rack to the top position and preheat the oven to 475˚F. Toss together the cauliflower, tomatoes, olive oil, capers, 1/2 teaspoon salt, a few grinds of pepper and the garlic on a baking sheet. Roast until the cauliflower browns in some spots and is tender, tossing about halfway through, about 20 minutes. Toss with a squeeze of lemon and the parsley. Serve warm. Makes 4 servings. Throughly rinse the cauliflower, then dry off completely and cut into bite-size florets and place them in a large bowl, set aside while you make the sauce. In a small saucepan, melt the butter, but careful not to brown it. Turn the heat off the butter then add all the remaining ingredients (except the cauliflower florets and parsley) and throughly mix. Now taste and see if the sauce needs any adjustments. Pour the sauce over the cauliflower florets and stir to distribute the sauce to coat. Set the bowl aside to marinate for a minimum of 30 minutes but preferably one or two hours (you can leave it on the counter or place in the refrigerator). Preheat the oven to 400°F. Meanwhile spread the marinated cauliflower onto a foil lined baking sheet, try not to crowd the florets. Place in the centre of the oven and roast for 15 to 20 or until the cauliflower is tender and beginning to brown a little bit. Remove from the oven and allow to cool slightly before serving, garnished with parsley and lime wedges. Makes 4 side dish servings. Their is no cream in this delicious soup, making it very light. The ham adds protein and flavor, and the croutons add a nice crisp texture. Perfect for a light lunch, or first course. For the croutons: Position a rack in the center of the oven and preheat the oven to 400˚F. Arrange the bread cubes in a single layer on a rimmed baking sheet. Drizzle with the olive oil. Sprinkle the thyme on top and season with the salt and pepper if using. Toss until coated. Bake until golden and crisp, 12 to 14 minutes. Set aside to cool. In a large pot, melt the butter over medium-high heat. Add the celery, shallots, 1/2 teaspoon salt and 1/4 teaspoon pepper, and cook until soft, about 4 minutes. Add the garlic and cook until aromatic, about 30 seconds. Stir in the chicken broth, thyme and cauliflower. Bring the mixture to a boil. Reduce the heat to a simmer, cover and cook until the vegetables are tender, 20 to 25 minutes. Remove 4 pieces of cauliflower per serving to garnish the top of the soup. In batches, puree the soup in a food processor, emersion blender, or potato masher, blending until smooth, or lumpy if you like. Season with salt and pepper if necessary. 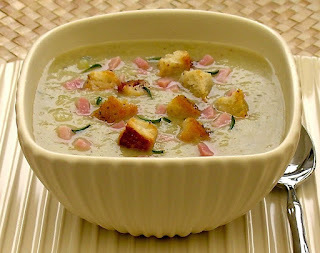 When ready to serve, ladle the soup into bowls and garnish with the croutons, minced ham, and pieces of cauliflower. Serve as a light lunch, or as a first course. Makes 4 servings. This is a traditional French cauliflower side dish that Americans love! It has a crispy, baked Panko top layer, which is an essential component of gratin dishes. Over medium high heat, bring a pot of water to a boil with the salt and sugar added. Blanch the cauliflower florets for no more than 5 minutes or until al dente. Drain completely and set aside. Over medium low heat, melt 2 tablespoons of the butter. Add the flour and whisk constantly for 2 minutes to make a roux. Pour in the milk and bring to a simmer, whisking continuously to remove lumps until sauce thickens, about 10-15 minutes. Remove from heat and season with salt and pepper to taste, nutmeg, 1/2 cup of the Gruyere cheese and 1/2 cup Parmesan cheese. Pour 1/3 of the sauce in a 1 1/2 quart, 9"x 13" baking dish. Top with cauliflower and pour the rest of the sauce over it. Combine Panko with remaining Gruyere cheese and sprinkle on the cauliflower. Melt the other 4 tablespoons of butter and drizzle it over the casserole. Bake at 375˚F for 25-30 minutes or until the top is brown, and bubbly all over. Let sit for 5-10 minutes before serving. Great with everyday pork chops, or roast chicken, or served at Thanksgiving! Makes 4 to 6 servings. *Note: Gruyere cheese is an excellent melting cheese. Named for the town of Gruyères in Switzerland where it was originally made, Gruyère cheese is a firm cheese with a pale yellow color and a rich, creamy, slightly nutty taste. If you can't find Gruyere, try Emmental, Jarlsberg, or ordinary Swiss cheese would be a decent alternative.